It was not too long ago that I assessed this performance on DVD and so, for a full consideration of this striking and somewhat controversial production, I refer you to that earlier review (see here). 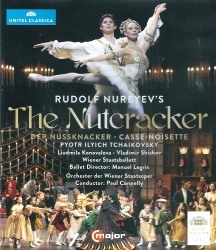 As I noted at that time, Rudolf Nureyev's concept of The nutcracker is decidedly dark and more than a little quirky. To be honest, its scarcely-veiled allusions to psycho-sexual themes make it more of an entertainment for grown-ups than one aimed at the traditional children's audience. Even if those adult references pass over the heads of the younger children, of whom we see a large number in the Staatsoper audience, I'm not sure that some of the darker - in every sense - visual images wouldn't be a little too scary for them. If I've had no cause to change my opinion on Nureyev's production and the Vienna performances, what, if anything, has this Blu-ray Disc added to the deal? Certainly the picture quality is improved in its new technically superior format. Images are generally sharper and, with much of the on-stage action taking place on sets that are less brightly lit than usual, sometimes more clearly delineated. What looked before a little dull, can now emerge as richly-toned or even opulent. The richly embroidered detail on some of the costumes is, for example, more obvious on Blu-ray. In fact, the medium's extra clarity even manages to add a little more desperately needed sparkle to Nureyev's all-gold Waltz of the flowers, although I still can't imagine ever seeing a drearier or less imaginative combination of set, costumes and choreography in that particular number. The overall result - as is almost always the case when watching ballet or opera on Blu-ray - is an enhanced sense of immediacy and of "actually being there." That's especially the case if you watch this disc in a darkened room and turn up the - very good quality - sound to an appropriately theatrical level. Your own reaction to the Nureyev production will probably determine whether you actually want to "be there" more than once at all. Personally, I'm pleased to have acquainted myself with this version and to have experienced a concept that has polarised critical opinion for decades. Having watched both the DVD and the technically superior Blu-ray disc in pretty quick succession, I'm not sure that I'll be returning to either of them again for at least a little while.